Becky Lynch appeared at a WWE Live Event on Saturday, February 9 and wreaked havoc in the ring. “The Man” attacked Charlotte Flair and SmackDown Women’s champion Asuka during their match, where she beat them both down with a crutch. Lynch has been selling a worked injury to her left knee since The Royal Rumble on January 27 and WWE has kept her out of the ring since then. Lynch earned the right to challenge for either Asuka’s SmackDown title or the Raw Women’s Championship currently held by Ronda Rousey. Becky chose Ronda and now the two will face off for the gold at WrestleMania 35. Of course Becky’s title shot was recently put in jeopardy thanks to Stephanie McMahon, who insisted she get get cleared by WWE’s doctor. Lynch refused and so she was storyline suspended from the company. 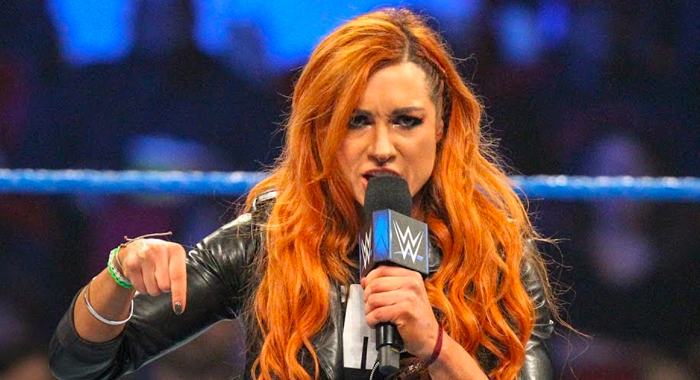 Lynch took out her frustration on Stephanie, as well as Triple H.
Many WWE fans believe that the match between Becky and Ronda will become a Triple Threat Match that also features Charlotte. Considering that Becky keeps stoking the fires with Flair, it could very well be that both women will indeed face Ronda on The Grandest Stage of Them All.